Earlier this month I told you about a book I am writing, my very first ebook, 7 Ways to Simplify Your Holidays. Next week this book will be available for sale, but today I want to give you a chance to not only win a copy but pre-order your copy at a special price! This book will help you find ways to simplify the parts of the holiday season that bring you stress and keep you from fully enjoying the holidays. 7 chapters full of actionable steps, free printables and resources to help you simplify the season. The holiday season, that extended period encompassing all things fall and winter, can be busy hectic and full of joy all at the same time. Sometimes our focus on prep and making the holidays just perfect can lead to more stress than joy. It’s so important to have balance this time of year so we can truly enjoy everything this season has to offer. I strive to live a simple creative life, this book encompasses what I have learned and ways that I am able to reduce stress and enjoy the special moments of the season. You can see my simple holiday moments on Instagram using #SimplifyYourHolidays. I would love to see your moments this year and those special memories from years past, just use the hashtag so I can find you. 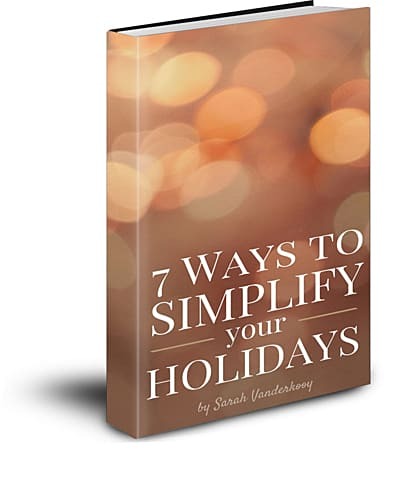 Pre-order your copy of 7 Ways to Simplify Your Holidays now! Use code simplifypreorder to save $1. This code is only good through the end of August, so secure your copy today. By placing a preorder your copy will be available as soon as the book releases on 9/2/15. This reduced price is only available until 8/31/15. Want to win a copy before it’s available? Enter below, this contest ends Monday 8/31/15. Winner will receive the book via email on 9/1/15 before it releases to the public. I hope you are inspired to simplify your holidays. Be sure to subscribe to Creative Ramblings and stay up to date on this book and future products. So glad to hear that Lisa! I love to simplify my life however I can. This looks like a wonderful book!